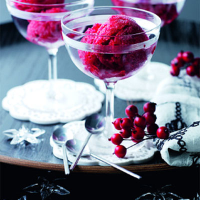 The deep cranberry colour and flavour of this sorbet makes it perfect to serve as a Christmas dessert. Keep one in the freezer ready for entertaining. Place 50g of the sugar in a medium pan with 150ml cold water. Heat gently, stirring until the sugar has dissolved. Add the cranberries, bring to the boil, then cover and simmer for 15 minutes, stirring occasionally, until the fruit becomes pulpy. Allow to cool slightly, then place in a food processor and blend to a smooth purée. Place a sieve over a bowl and, using the back of a spoon, press the fruit through to remove the skin and pips. Set the purée to one side and leave to cool. Meanwhile, make a sugar syrup by placing the remaining sugar, 350ml cold water and the lemon juice in a small pan. Heat gently, stirring, until the sugar has dissolved then simmer for 2-3 minutes. Leave to cool. When cool, add the sugar syrup to the cranberry purée, stir well until smooth, then pour the mixture into a 1-litre freezerproof container and place in the freezer. Freeze for 2-3 hours until the mixture is slushy. Place in a food processor and whizz to break up the ice crystals. Return to the freezer. Then, every 2 hours, use a fork to draw the ice crystals from the edges to the centre until the sorbet is smooth and even-textured with tiny ice crystals. Serve when needed. This sorbet can be made in an ice cream maker following the manufacturer’s instructions. The sorbet will keep in an airtight container in the freezer for up to 3 weeks. If liked, serve with a couple of Florentines from Waitrose Florentine Assortment.